Home / Blog / Electric scooters: promise or peril? Electric scooters: promise or peril? Active Trans has long been a believer in the power of bike sharing to increase bicycling, sustainability, equity and more. Divvy recently topped 15 million rides since launching in 2013, and new dockless bike-sharing companies offer the potential to improve and expand bike share if cities adopt the right policies. But what about electric scooter sharing? This new service has already arrived in San Francisco where it has been wonderful or awful, depending on who you ask. Similar to dockless bike sharing, these scooters are self-locking and customers use an app to unlock and ride them. When the ride is over, the scooter can be left anywhere within the designated service area. Also similar to dockless bike sharing is that there have been problems with sidewalk riding and parked scooters blocking sidewalks and doorways. 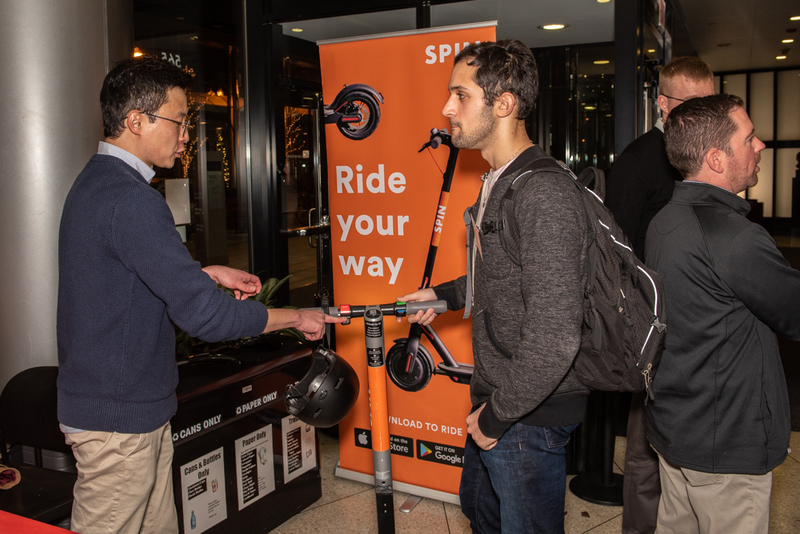 Legislation has been proposed in Springfield and the city of Chicago to pave the way for scooter sharing, and if the scooter companies have their way, Chicago would have scooters tomorrow. While scooter sharing is promising, there are details to be worked out. Active Trans has helped apply the brakes on these proposals to make sure it’s done right. Getting it right means that riding scooters on sidewalks is not allowed, nor is creating obstructions with parked scooters. Active Trans wants speeds capped at 15 mph, and we are concerned about reports of e-scooters traveling much faster in bike lanes and trails. We think cities and park districts should decide whether to allow e-scooters in bike lanes and trails because in some cases the lanes/paths may be too narrow or crowded or have other design features not conducive to scooters. We also want to make sure locals have the ability to revise a decision on scooter use if, for example, a bike lane becomes too crowded over time. As with bikes, we don’t want people forced to ride scooters in harrowing car traffic conditions nor should they ride on sidewalks and threaten people on foot. But roadway space is limited because cars hog most of it. Even in downtown Chicago, cars move only about 20 to 30 percent of the people but occupy the majority of the public right of way, not to mention the additional space devoted to off-street parking. Which gets me to perhaps the most intriguing potential upside for scooter share: scooter riders can join forces with bicyclists to undo the vice grip that cars have on street space. Early reports from San Francisco suggest many scooter riders don’t ride bikes. Presumably, they feel more comfortable on a scooter. But, like bicyclists, scooter riders want to get out of car traffic, which means the ranks of people calling for a more efficient, fair and safe allocation of street space – with protected bike lanes, car-free streets, wider sidewalks, etc. – can grow with scooter share. Indeed, Lime reports around 10 rides per day on their e-scooters vs. 1 or 2 rides per day on their e-bikes. Better yet, cities can collect fees from scooter sharing programs to help pay for these street improvements. Scooters are another way to move people more efficiently and safely than 3,000-pound cars that also require a sea of pavement for parking. People are using scooters as a “last mile” connection to transit and other non-auto transportation options, which means they have another way to avoid owning or using cars. And for those of us who think bikes are a better choice than scooters, I suspect scooters will be a “gateway” to bike riding by allowing people to become more comfortable riding in the street. With new mobility options emerging and public opinions changing, the stars are aligning to allocate less street space for inefficient and dangerous cars and more space for smaller/high efficiency vehicles like bikes, scooters, electric skateboards and whatever comes next. Rather than pitting people on bikes, scooters and foot against each other, we need to work together to reclaim street space from cars.